The French President Emmanuel Macron has showed his unfortunate inexperience as a politician by voluntarily joining the American Israel lobby that supports and finances the illegal settlements in the Occupied Territories that now hold over 600,000 Israeli citizens on land belonging for over a thousand years to the indigenous Muslim Arabs of Palestine. Macron was absolutely right to acknowledge the criminal insanity of the wartime Vichy government that collaborated with the Nazis by voluntarily transporting a quarter of the Jews of France to death camps in Eastern Europe but he is completely wrong to equate anti-Zionism with anti-Semitism. Zionism is a political, supremacist ideology that has led to the only neo-colonial regime of the 21st century – a regime that has violently dispossessed over five million indigenous Arabs and has turned the region into a flash-point for a global nuclear war. 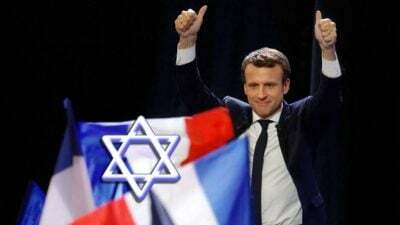 Mr Macron may have been an experienced investment banker and bond dealer but he is an inexperienced and novice politician who has allowed himself to become part of the Political Zionist movement whose objective is a ‘Greater Israel’ extending from the Nile to the Euphrates. That, of course, will never happen but Macron has jumped feet first into a bloody river in which he will find it impossible to swim. Just another naïve, over-ambitious politician who has been easily inducted into Zionist ideology by very experienced, political manipulators. Quelle tragedie!